Casino Cromwell will then reward you with a bonus (Welcome Bonus is for new players only). The terms and conditions of the bonuses vary between different casinos and might also change over time and between different countries, so it is important to compare the different offers and read the T&C for Casino Cromwell before signing up. Casino Cromwell opened is virtual doors to a global audience in 2017. This respectable online casino is operated by a company licensed and regulated by the laws of Curacao, meaning that players can expect a service that follows all of the industry-standard regulations. This gaming venue recognises the player’s security and safety come first and that’s why the casino employs the best and up-to-the-minute security protocols in the industry. Since they use encryption software which has been verified by Comodo Ltd, all your financial transactions and personal information are encrypted and kept safe. In addition to this, you are guaranteed to be getting a fair game because they use a certified and audited Random Number Generator (RNG) that makes sure the games produce unbiased results. The website boasts slick and elegant design, as well as a black background which is there to set up the mood for gaming without any distractions. 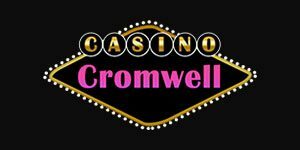 Like any good online casino, Casino Cromwell have made their site accessible for Android, Windows or iOS powered devices. You can spin as you go about your day-to-day business, just open the website on tablet or smartphone and enjoy seamless performance. The Casino Cromwell’s library is powered by several software providers, including the industry popular Microgaming, NetEnt, and Betsoft. A portfolio bursting with industry-leading names is expected to be nothing short of impressive. Neatly arranged under ‘Featured Games’, you will find different game categories: featured, 3D slots, other games, live casino, table games, video poker and classic slots. Though well-organised, they can’t be sorted by software providers, which would make it even easier to navigate. Casino Cromwell features a wide collection of exciting slots. There are, of course, popular slots to be found here like Gonzo’s Quest, Starburst and Dead or Alive. However, what especially stands out is the collection of cutting-edge 3D slot games that come in interesting themes along with high quality graphics and animations. Heist, True Sheriff, Dr. Jekyll and Mr. Hyde, Madder Scientist, Frankenslot’s Monster, Good Girl Bad Girl, The Slotfather 2, Under The Bed, The Curious Machine, 2 Million BC, Pinocchio, are just some of the titles you will be able to enjoy. Some of the newer releases you will find here include Chillipop, Yak, Yeti and Roll, Ogre Empire, Tiger’s Claw, Thunderstruck, Dragon Kings and The Golden Owl of Athena. As for the table games, the assortment found at Casino Cromwell covers most popular variations of Blackjack, Baccarat, Roulette, Poker and Craps. If you are a poker fan, you will be pleased by the following types: Texas and Casino Hold’Em, Caribbean, Oasis, Pai Gow, Red Dog, Pontoon, High Draw Low, and more. Additional games available include Scratcherz and Virtual Racebook 3D. And let’s not forget video poker and pyramid poker; you will be able to play them, too. At your disposal are also Jacks or Better Double Up, Tens or Better, Deuces Wild, Aces and Faces and Joker Poker, to name a few. There is only one live dealer title in Casino Cromwell live casino section. However, as the casino is only expanding into the online world, we look forward to seeing more as Live Dealer games become the industry standard and one of the most popular iGaming assets. Payments are possible with many different methods, among which the credit and debit cards Visa and MasterCard hold the most prominent place. Neteller, Sofort, PaysafeCard, Skrill, Giropay, Bank Wire Transfer are also available. It also needs to be noted that this gaming establishment accepts Bitcoin as the leading form of cryptocurrency. Talking about currency, casino accepts payments and allows transactions in US, Australian and Canadian Dollars, Euros and British Pounds Sterling. The minimum amount for a deposit is £/€/$ 25 and for withdrawals it is £/€/$ 50. The withdrawal limit is determined by the depositing sum and can vary on a weekly or monthly basis. They also have VIP Casino Cromwell program with special benefits and incentives given to the loyal customers. There are four levels: premium, silver, gold and platinum and they vary based on what sum you deposit. For example, if you deposit €/£/$ 300 then you gain access to the premium level, €/£/$ 500 for the silver, €/£/$ 1500 for gold and €/£/$ 2500 to get to luxurious platinum level. Meet the conditions and upgrade from Bronze VIP level all the way up to Elite VIP and reap all the benefits. When it comes to customer support, here at Casino Cromwell, they strive to help you with any question or problem in as many ways as possible. Their friendly and professional customer support team is ready to help 24/7, so don’t hesitate to contact them. You have several options to get in touch with them, just choose the method that works best for you. One quick way is to submit a question is to fill in the contact form. Another easy thing you can do to reach them is send them a message via live chat. Or you can send them an email at [email protected] for general concerns and at [email protected] for questions about transactions.